Saved from the scrap bin! Now, I know they say you shouldn’t use these things as step-stools and mini-stepladders but, I’m not afraid to admit that I do just that, sometimes. 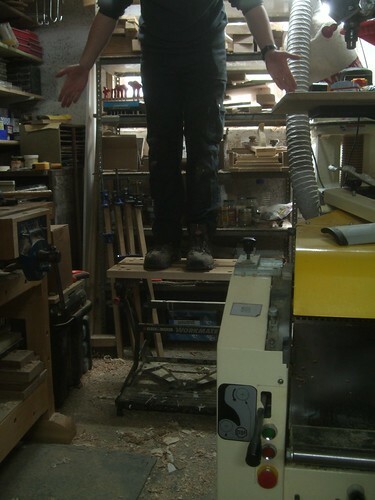 My Workmate demands space in my workshop as a convenient base unit or stand for my bench-top router table. Yet, with everything else I have crammed behind the garage door, I don’t have room for a proper set of steps or even a small ladder. From experience, I’ve learnt that the 16mm thick top will withstand my full body weight (with notable deflection!!) but, to me, the greater danger comes from the super-slick surface. Sure, I could just abrade or sand this back to provide some texture but, the extra weight of solid beech on top should provide the extra stability these modern designs lack (if ever you’ve tried to use one on-site to cut any length of wood, you’ll know what I mean!). So, these offcuts… They’re the kind of almost-spindle-sized scraps that you can’t bear to throw away as you “know” they’ll come in handy some day… Yet, that day never comes! With each one in turn, I planed a face and edge, cut two parallel sides on my bandsaw and then thicknessed only the wider faces, achieving as large a finished size as possible. 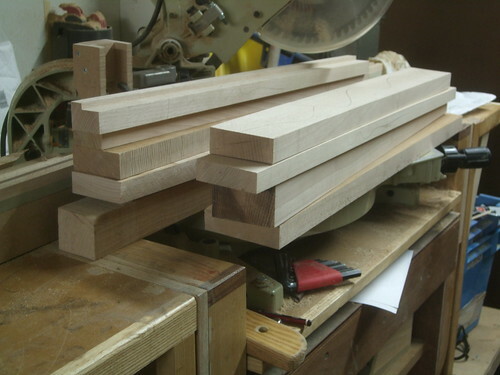 I didn’t bother planing the sawn edges as I was going to have to dress these later, anyway. Out with the sash cramps and my new Titebond Extend wood adhesive. I was worried that I wouldn’t get it all together in time but, to be honest, it took less than the length of one Def Leppard song on the radio (I forget which one!) to get each in the cramps. So, I could’ve used Titebond II after all, without any worries. Titebond advise that you should leave an assembly in the cramps for at least one hour, where as, with ordinary Titebond II (and their original), you can take the cramps off after only half an hour (conditions, temperature and humidity permitting, of course). I scraped off all the excess and stuck it back through my thicknesser to true up both faces, before a good sanding with a 120g belt on my belt sander. All this work and the joints remained fully in tact! 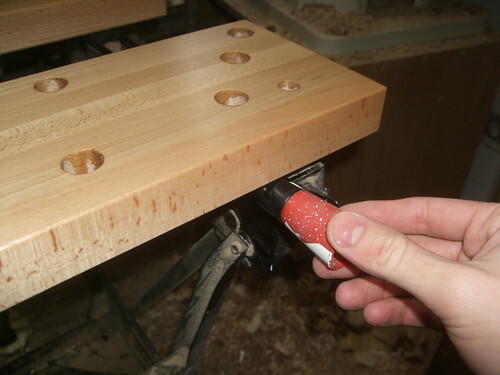 I used one of the original tops – about half the thickness of my new beech ones! – as a template to mark out the dog-hole positions and even added a couple of my own. 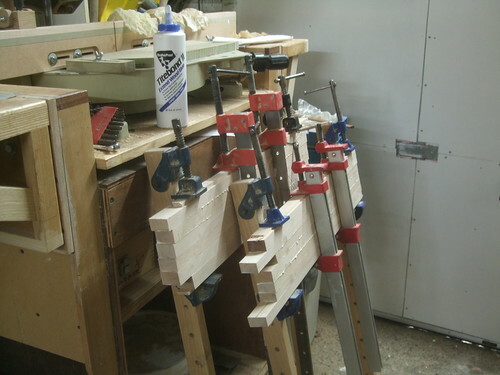 These were all drilled out with a 19mm/¾in forstner bit (rather than 20mm) so that I can also use my Veritas accessories, if ever I’m working away from my main workbench. You’ll also note from the above photo that my new tops happen to be slightly wider than the old ones. While this is fine for the ‘rear’ piece, I eventually had to trim approximately 12mm from one edge of the front one, where it was restricting the operation of both front levers (see below). I should also mention that I had to counterbore the bolt clearance holes quite deep so that I could still use the original bolts. But, of course; being a standard, metric M8 thread, you could easily replace them with longer bolts (I don’t like throwing things away!). After three coats of Danish oil for protection from spills, it’s looking good and, without question, this next photo shows the scale of the improvement (I weigh about 13 stone…). Even though there isn’t a hint of flexing in the top now, I still cannot recommend standing on this as the oil leaves a rather slick finish. Overall, it’s added some weight to the structure but the framework below remains as lightweight as before. 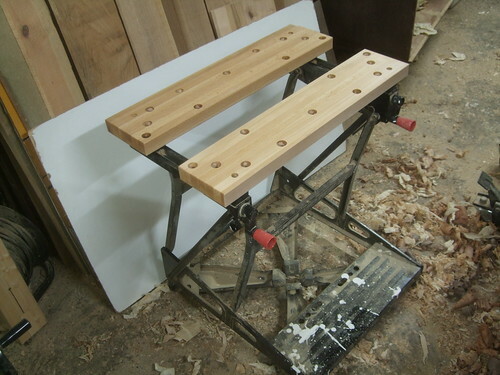 Sawing and clamping is a little easier but, because of the weedy frame, it still doesn’t come close to competing with a half-decent workbench for comfortable hand-planing! I think the only solution there would be to fix it to your workshop floor…! 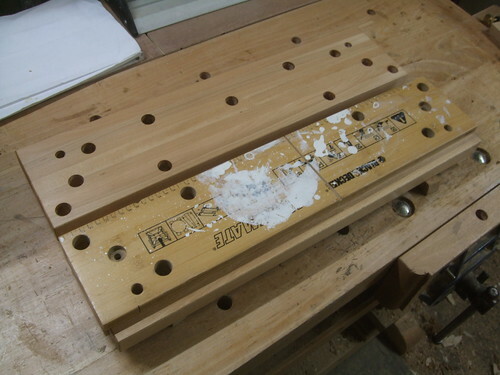 So, if you do have any scraps of wood lying around – or, even, an offcut of timber worktop – and you’re unhappy with the top on your portable workbench, this is one solution for clearing some of that clutter!